Which BARF is best for my dog? High Energy patties include our Chicken, Lamb and Beef Recipes. These are most suitable for active working dogs, during late pregnancy or lactation or for small breed growing puppies. They are also suitable for normally active adult dogs, but the amount fed may need to be reduced to prevent the dog gaining weight. These should be fed with care to large breed growing puppies, to prevent them ingesting too much energy from eating these, resulting in rapid growth and skeletal problems. These are not recommended for overweight dogs, needing to lose weight, or for older, less active animals. This may be divided into 2 meals and the quantity reduced if fed as only part of the entire diet. Every animal is an individual and this is a guide only: adjust the feeding level to maintain desired body condition. Always ensure plenty of fresh, clean water is available for your pet. Note that the exact nutritional analysis for each BARF recipe will vary slightly with seasonal changes. This may cause differences in colour and consistency. Such variations are normal and serve to enhance health in accordance with the Evolutionary Principles of Nutrition. There is no need to adjust the feeding level to adjust for these changes. The Moderate Energy patties include our Combo Recipe. These patties are most suitable for normally active adult dogs and growing large breed dogs. 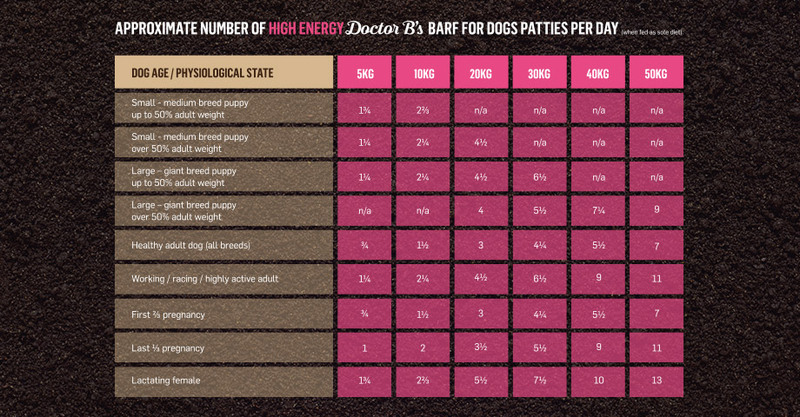 The patties can be fed to highly active working dogs, during late pregnancy or lactation or for small breed growing puppies, but the amount fed may need to be increased to provide the dog with sufficient energy to meet its nutritional needs. 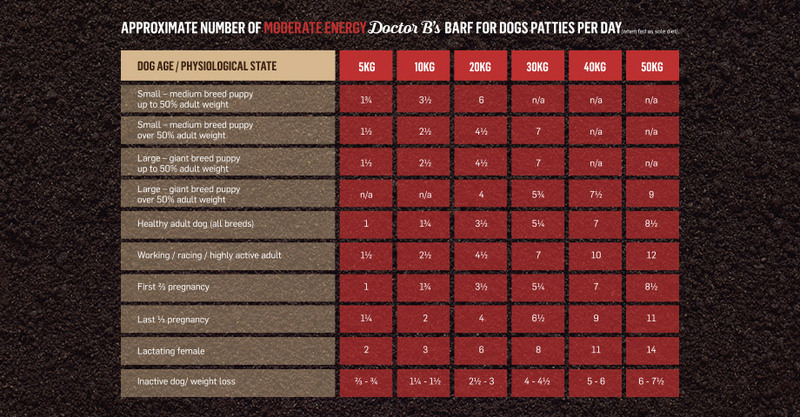 The high energy patties are preferable for these groups of dogs. These patties are not ideal for overweight dogs, needing to lose weight. 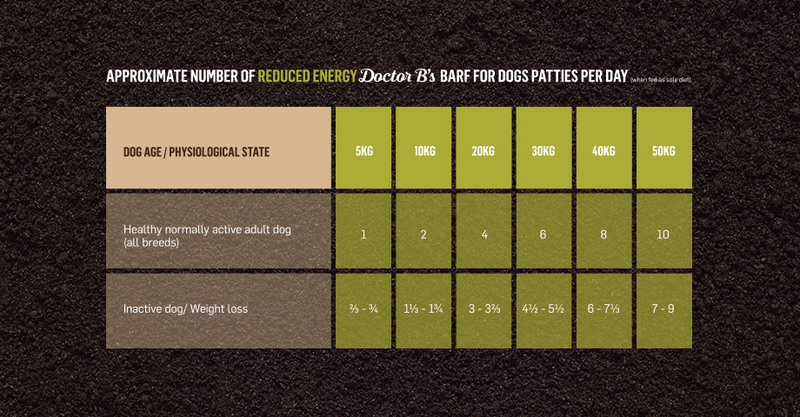 In these cases, patties in the reduced energy group would be preferable. If moderate energy patties are fed, the amount fed will need to be reduced to reduce calorie intake. The Reduced Energy patties include our Kangaroo and Lite Recipes. These flavours are most suitable for older or less active dogs, as well as overweight dogs needing to lose weight. These are also suitable for normally active adult dogs, with a slightly increased feeding amount required to meet their energy requirements. The Lite Recipe is unsuitable for growing puppies, or for females during late pregnancy or lactation, as it has a reduced calcium and phosphorus content, which is not sufficient to meet their nutritional needs. High energy patties are preferable for these animals. The Kangaroo Recipe is not ideal for, but may be fed to large or giant breed growing puppies, but the amount fed will to be increased to provide the dog with sufficient energy to meet its nutritional needs. Moderate energy patties are preferable for these animals. These are not ideal for highly active working dogs. The amount fed will need to be increased to provide the dog with sufficient energy to meet its nutritional needs, or other high energy foods included in the diet. High energy patties are preferable for these animals. Doctor B’s BARF comes in six ‘Recipes’ (or flavours or varieties) for dogs, including Chicken, Beef, Lamb, Kangaroo, Combo and Lite Recipes. 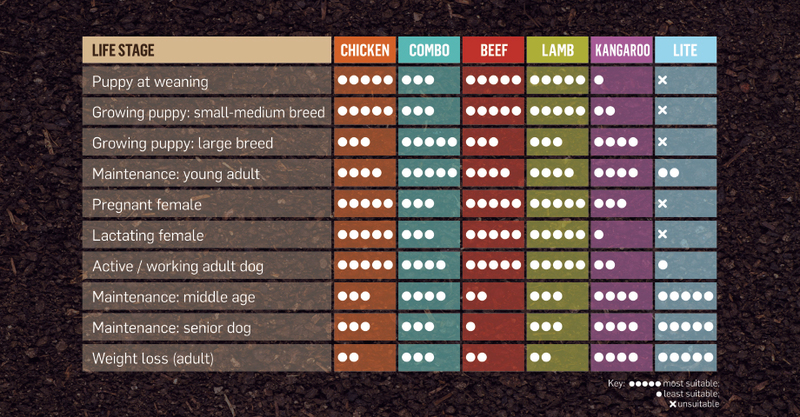 For a healthy adult dog, all of these are just fine, indeed, mixing and alternating the various Recipes is a perfectly acceptable (and recommended!) option. The wide range of flavours allows pet carers to rotate their pet through a wide range of different primary protein types; this helps to fulfil the evolutionary principle of providing balance through a wide range of raw protein-sources. In certain life stages and health conditions, you may wish to select one flavour over another. The table at the top of the page provides a general guide. For dogs with health issues – e.g. Kidney Disease, Pancreatitis, Diabetes Mellitus or Obesity, these dogs usually require extra vegetable material, sometimes with less fat; in the latter case, combine a reduced amount of Doctor B’s Lite Recipe patties with raw pulped low glycaemic index vegetable material. The phosphorus and protein levels in the Lite Recipe are reduced compared with the other flavours to make this more suitable for dogs with kidney disease.